One of the main reasons I bought my iPod last year was to use it as a portable hard drive to backup my photos from my laptop during my trip to Britain last year. Another reason was to consolidate the CDs in the car. I wasn’t buying the whole podcast thing, not quite. The Digital Story – O’Reilly author and editor Derrick Story is building a cottage industry around his “online camera club.” I have a draft of another blog post about this. If you want to improve your digital photo skills, listen to this. Science Friday – Ira Flatow’s NPR news show on the hot stories from the world of science that week. Listen and learn. News from Lake Wobegon – The weekly update segment from Garrison Keillor’s “Prairie Home Companion” radio show. Last time I was at Mom’s, I played a bunch of these for her. Living on Earth – Another public radio program, this one showcasing environmental stories. The producers do a great job of giving balanced coverage to the issues they cover. This show and Science Friday have both had very good coverage of alternative energy issues of late. Looking at the list, I guess I get what I want from public radio when I want it. Another thing you may notice is that almost all are done by radio professionals. The common thread is high production value. I read somewhere a while back that production value is what keeps people coming back to a podcast. I know I tried listening to one or two where a newspaper columnist basically read a printed article into either a small digital audio recorder or a computer microphone. It was almost unbearable. Most of my CDs have yet to be ripped and copied to the darn thing. My headphones hardly get used either–that might be different if I flew more. Feel free to leave further listening recommendations in the comments. I don’t know when I’ll get to them though. I seem to have a backlog. Maybe I’m not driving enough… or I need to fly more. 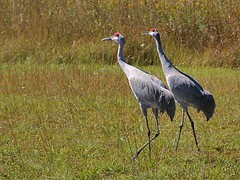 The two resident Sandhill Cranes were making a ruckus in the neighbor’s backyard today. I grabbed the iPod and recorder and stepped outside. Listen to what they sounded like flying off. I wish I could have gotten out there without them noticing. The picture is from late October. This is one of the sorts of things I imagined doing when I bought the audio recorder. 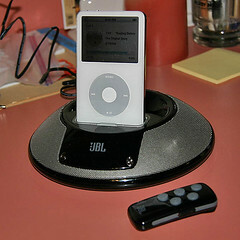 This was recorded using the built-in stereo microphone.